Official Lineup for Ring of Combat 59 | Lou Neglia's Ring of Combat | Next Generation of Mixed Martial Arts! Ring of Combat is set to take place Friday, June 2nd inside the showroom of the Tropicana Atlantic City, New Jersey with another solid card of MMA action including four title fights. In the main event, Shelton Graves (5-3) makes his first title defense against the very man he snatched the title from, Brendan Barrett (10-6-1). These two goliaths met previously in 2016 at ROC 56 where Graves would earn a TKO in round three against the long time reigning heavyweight champion. Barrett looks to even the score and win back the title in the process. The co-main event will feature two of the best featherweights on the east coast when defending champion, Julio Arce (11-2) takes on fast rising Pat Sabatini (6-1) in a much anticipated matchup. Arce won the featherweight title via unanimous decision from Frank Buenafuente (7-4) at ROC 57 in a close contested matchup. The two would rematch and this time, Arce would left little doubt who the champion was as he dispatched Buenafuente in round two via rear naked choke at ROC 58. That same night Sabatini, also won via RNC when he took on tough challenger Michael Lawrence (4-2). Now Sabatini looks to show the MMA world there is a new kid on the block. The Ring of Combat Regional Bantamweight Title is up for grabs when New York’s Brandon Urquijo (2-0) takes on New Jersey’s William Elliot (2-0). Fighting for just the third time in two years, Urquijo is making a name for himself with dominant performances against tough opposition. Elliot has yet to hear the final bell as he dispatched both his previous opponents via TKO. In a bout where someone’s “0” has to go, both fighters look to remain undefeated and while becoming the ROC BW champion. In a bout where history could be made, current ROC welterweight champion, Sidney Outlaw (7-3), looks to be the first ever ROC fighter to hold two titles in two different weight classes when he takes on James Rumley (3-3) for the regional lightweight title. Outlaw picked up ROC gold when he beat Tajuddin Hakim-Abdul for the vacant welterweight title at ROC 58. Rumley looks to play the spoiler by defeating Outlaw and winning gold. The remainder of the card is as follows: Michael Trizano (3-0) vs Michael Lenoci (4-2); Wendell Sneed (2-0) vs Tajuddin Hakim-Abdul (4-1); Tevin Cooke (3-1) vs Paul Grant (3-3); Michael Elshamy (3-4) vs Kristopher Gratalo (2-1); Edwin Smart (4-0-1) vs Chris Stanton (1-0); Robert Jimenez (1-1) vs Dominick Biondo (0-1); James Gonzalez (3-1) vs Michael Lawrence (4-2). 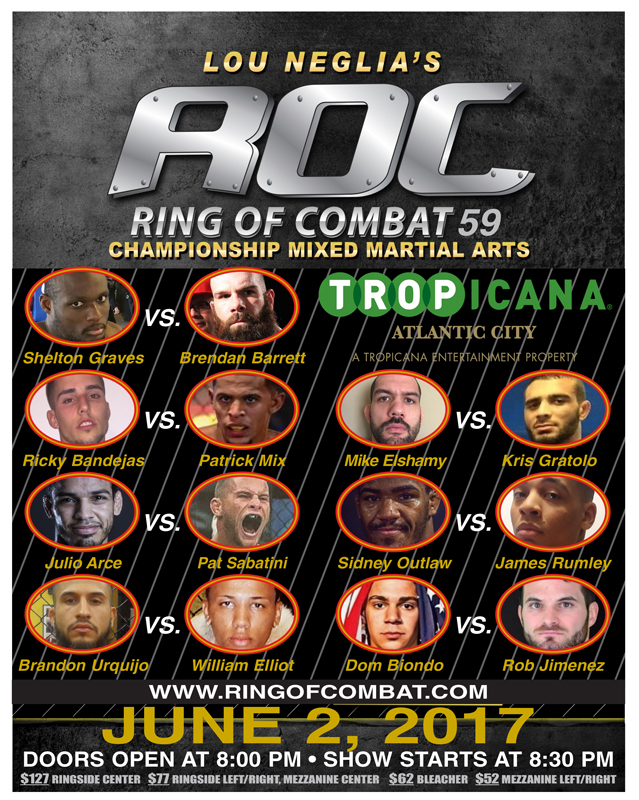 Ring of Combat 59 will take place June 2nd at the world famous Tropicana Atlantic City showroom. Doors @ 8:00 PM / Fights @ 8:30 PM. Tickets are priced between $52 and $127 and can be purchased at the Ring of Combat website, the Tropicana Box Office or any TicketMaster outlets. This is sure to be another sell-out event, so get your tickets TODAY!